For weeks my lovely email friend Sylvia in NY state has been teasing me about a package that was winging its way to Australia. Yesterday it arrived and it was chock full of lovely things – large eye needles and a fine needle threader in the shape of a heart, a really funky tape measure and a beautiful charm brooch. Here’s a close up of the brooch. Isn’t it lovely? I’ve never seen a brooch with charms on before. The charms are so detailed too, the tape measure even has markings on it! There was also a lovely card with a beautiful fabric quilt block with a bluebird in the centre but I forgot to photograph that. Thank you Sylvia. These gifts are so thoughtful, useful and beautiful. How did you know that brooches are my favourite pieces of jewellery? What a lucky girl you are! Those are quite lovely little gifts! I have a cute tape measure that has a crocheted cover that makes it look like a lady bug. They do so many clever things with them nowadays. I love your brooch. It looks handmade. Did Sylvia make it? Wow! Fancy being able to find charms like that!!!!!!!!! Sylvia must be a really lovely lady. Did she make the brooch? I’d love to know how it was made. She IS a really lovely lady! I think the brooch came from a quilt show. I’m so glad your package arrived! Broaches like that are quite popular here and I found it at a quilt show last year. Charms are always sold too at shows. 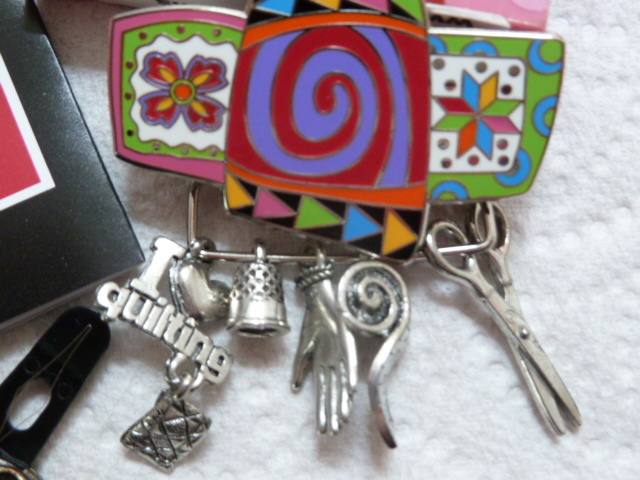 They make great gifts and so many cute sewing related charms to choose from. That pin is just Munaiba! lol I have one that is a red VW Beetle with the words “gone sewing” on it for myself. For those who don’t know, I own a ’61 VW. As to those needles and the threader, they may be “large eye” but my eyes sure have a hard time threading them. That threader is such fine wire, you can pull most any thread thru those tiny eyes. Love it! Munaiba is such a good friend. I look forward to hearing from her all the time. It’s so easy to send a bit of something to show her how much I appreciate her friendship!